Pascal Badet and his wife Sandrine have taken over this fine establishement. With long and successful experience under Alain Ducasse (including 5 years as head chef at the Louis XV in Monaco) behind him, Pascal, a local lad, has great technical ability and is a sensitive chef. He offers cuisine based on authentic flavour and products. 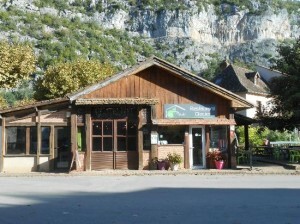 Located on the city hall square in Castelfranc at the Lot river’s edge, you will be welcomed by Olga and Eric. Its warm decor with an open kitchen and a terrace is the ideal place to eat grilled meat cooked over a wood fire and other delicious dishes. 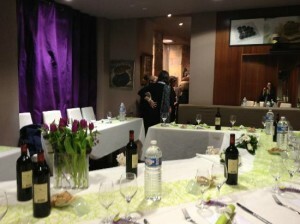 This restaurant offers you a touch of exoticism due to the origins and the professional experience of the chef. 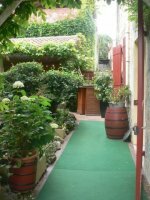 The Auberge du Vieux Douelle, better known as Chez Malique, has been an institution for five generations with its traditional cuisine: calf’s head, pain perdu, pastis, etc… Local and regional dishes, a “brasserie” menu with our famous home-made hamburger and chips, shady terrace, pool and children’s area with safe play equipment. Full menu and salad menu. 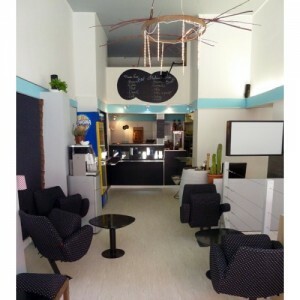 A contemporary setting and a pleasant atmosphere for an eclectic clientele, where, whatever your bugdet, you will find something to eat. The priority of the manager is the quality of fresh products and a family cooking. 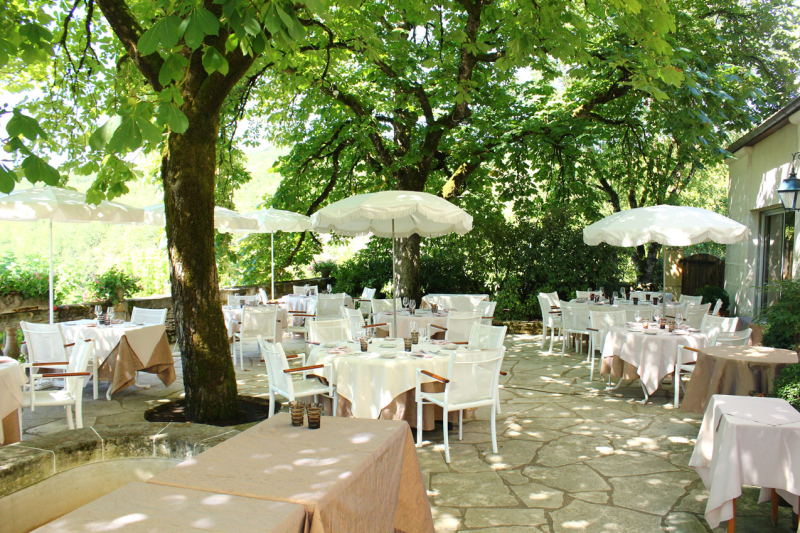 Located in the Lot Valley, at the bottom of the historical village of Saint-Cirq Lapopie, the setting is idyllic and the cooking will know how to satisfy the greatest appetite. You will be welcomed warmly and you will be able to eat a pizza cooked in a wood-fired oven or the traditional cooking of the Chef. At night, you can attend concerts from local bands. Christelle makes great effort to offer high quality services. 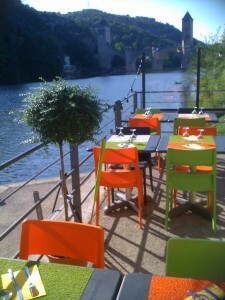 The restaurant, set up in an old garage with a view of cliffs, offers traditional dishes all along the year. 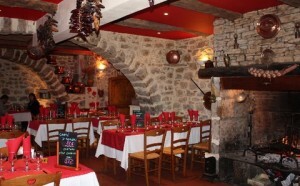 At the heart of a small traditional village, this splendid building from the 14th century hosts the Hotel Restaurant La Truite Dorée, family owned company for 5 générations. Restaurant with terrace , on the banks of the Lot river, at the foot of the pier. Refined cooking. Breakfast buffet and salads buffet based on fresh and seasonal vegetables. Products straight from local producers. For motorhomes, we have a special area with water and electricity specifically dedicated to motorhomes. 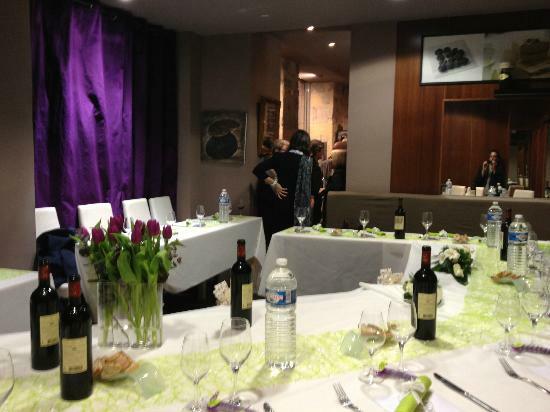 Welcome to Chateau Saint-Sernin ! 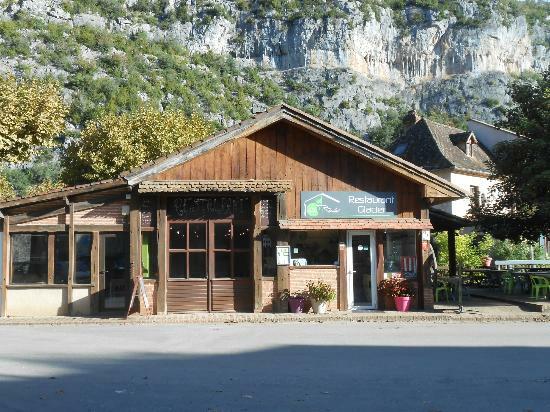 The Hotel Restaurant is located in the Célé Valley, on the pilgrimage road GR 651 of the Way of St.James, and only 1km away from the Pech Merle prehistoric cave. 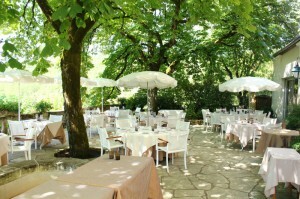 At only 9km of the picturesque village of Saint-Cirq-Lapopie, awarded « Favorite village of French people » in 2012, the Hotel Restaurant is an ideal base to discover the region. 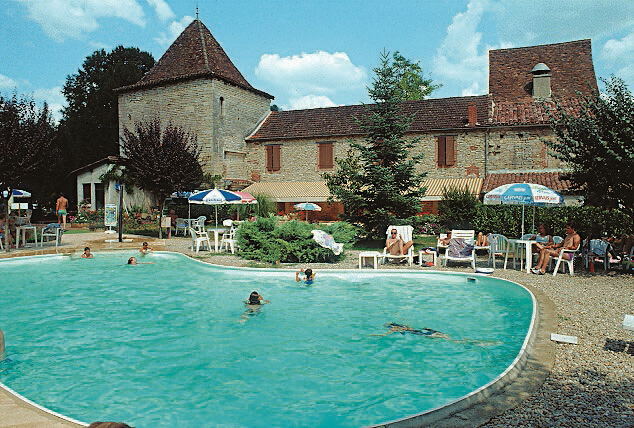 At the heart of the regional park of the « Causses du Quercy » you will be able to relax and enjoy cultural and sports activities in an outstanding scenery. 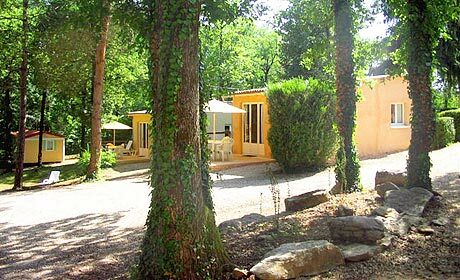 Located in an oak forest , this 4 stars camping offers all the indispensable comforts: a heated pool, a paddling pool, a solarium terrace, games and clubs for children, multi-sports ground, bar, restaurant, pizzeria… Sporting, recreational, and varied activities are organized throughout the high season, for the enjoyment of all ages. 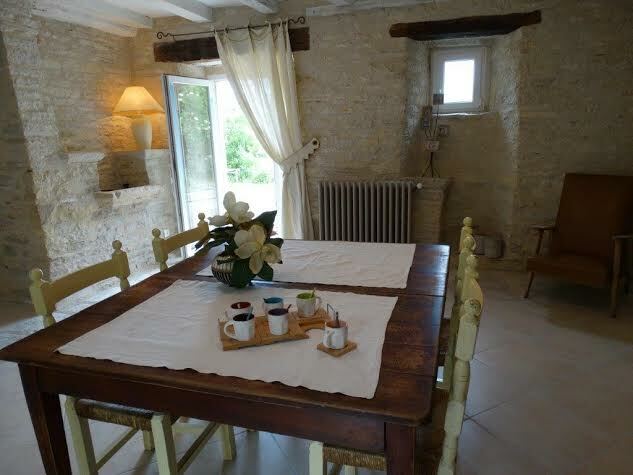 Charming traditional stoned-house, fully restored. Located in Catus, 15 kilometers away from Cahors. Many sotres at less than 2 kilometers away. 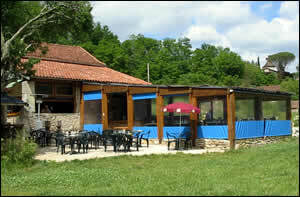 3 kilometers away from a lake with supervised swimming and many sports activities. 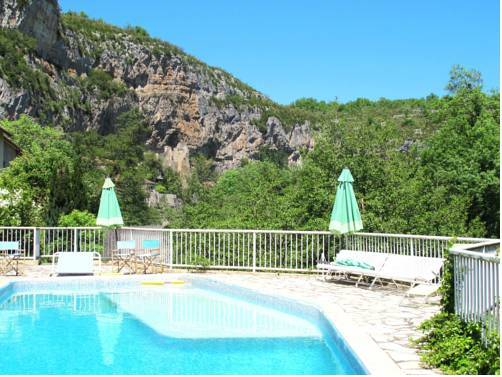 Outdoors: 2500m² garden, 3 terraces (North and South), covered bread oven, where you can grill meat or take a nap. Ground floor: Entrance, large living room that gives onto a terrace (South), dining-room with a fireplace (South and North terraces), fitted and independent kitchen that gives onto the North terrace, restroom, laundry room. First floor: Bathroom, restroom, 2 bedrooms with a 140 centimeters bed, 1 room with two 90 centimeters bed and one 80 centimeters bed. For further information please contact us through the “Contact” page of this website, or with the phone number above.